The briefing note “Funding flows to national and local humanitarian actors” along with a set of visualizations demonstrate current inequalities in the global humanitarian funding system. Not only is local humanitarian actors’ share of the global humanitarian funding very small – it is also extremely poorly tracked and documented. 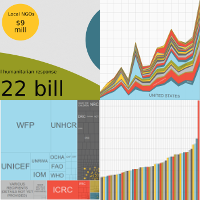 Explore how money travels from the biggest backdonors through the largest international agencies to national and local actors in the collaborative piece “The Humanitarian Economy – where is all the money going” co-published with IRIN here (external link) in 2015. In 2013, just three large multilateral agencies received more direct funding from major donors than all other humanitarian actors combined. The same year, local and national humanitarian actors are only known to have directly received about 0.2 % of the overall global humanitarian response. 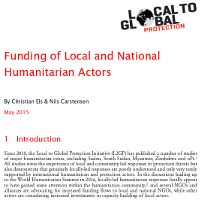 Given the importance of local actors in humanitarian crises, the low levels of funding as well as the lack of detailed tracking and information of funding to local actors may in itself indicate a failure in transparency and accountability for the global humanitarian system as a whole. Please note that in order for some of the figures in the briefing note to print correctly (horizontal), it’s advisable to set your printer to print with ‘auto rotate’.